For many years the mention of a recreational ground had been cast a side by Nuneaton's biggest voices. Mr Ward had been very vocal against the enterprise due to the possibility it costing the rate payer too much money. (it was proposed 1d in the £ was the rate). 1884 brought a new voice and one that wasn't going to give up so easily. Reginald Stanley made notice he wanted to set up a committee as soon as possible to give Nuneaton a place for not just the younger generation but for the old, the rich and the poor can gather together safely. He again found a gentleman opposing the recreational ground and again it was Mr Ward. It had been mentioned five years earlier to set up a subscription but that never happened. It soon turned into political battle by both men. It became heated, Mr Ward and Mr Knowles became upset with the questioning of Mr Stanley about there lack of support and they got up and left the Board meeting as Reginald refused to back down. Who would of thought a park for people of the town to enjoy would cause such a stir. The Recreational Ground didn't become reality for nearly eight years. We pick the story back up in 1892. Nuneaton has its recreational ground at last! Negotiations began with Mr James Tomkinson, Lord of the Manor. He agreed to give some land at a reasonable £50 a year, on a twenty one years lease. Local gentleman were approached for subscriptions to avoid the public taking the cost and close to £300 was gained from the following- Mr J F Johnson, R Stanley, E F Melly, J H Bland, Dr Nason, R W Swinnerton, C A Phillips and F Warter. The park was laid out with drainage, they set out walks with a shelter comprising of seating and a ornately covered bandstand. It had been said Reginald paid for the trees that lined the paths and Edward Melly paid for a complete set of gymnasium apparatus comparable with larger town's. The Nuneaton Observer wrote a story late in the year of 1892. They were unhappy with the fact that Nuneaton's new recreational ground had got the grand opening it deserved. Here is the piece from 28th October 1892. As far as appearances go at present - and we have made several inquires on the subject - there is to be no formal opening of the admirably laid out ground which has just been acquired by the inhabitants of Nuneaton for recreative purposes. It is certainly getting very late in the season to indulge in outdoor ceremonies and if the matter was deferred until the advent of spring the objection might be made by captious critics that it was very anomalous to open a ground which had already been open to the public for over six months. While very sensible of the awkward position in which affairs stand we still maintain that it will be a regrettable circumstance indeed if the Nuneaton recreational ground is allowed to become public property without a public recognition of the indebtedness of the town to those gentleman who have both initiated and carried out the scheme in a manner which redounds the highest credit upon them. In any case the meed of praise shall not be without by us. A map from the early 20th century. The recreational ground shown here hasn't changed much in shape just with a few more houses. Not everyone was pleased with the finished article and a prominent local figure voiced his concern. 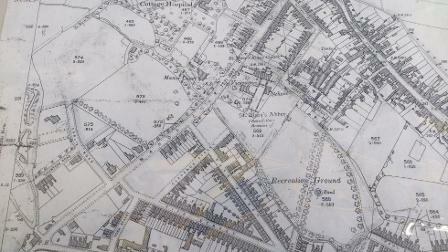 In early May 1892, Charles De Havilland mentioned in a letter, that the land for the Recreational ground a-joined to the back of his vicarage. A large numbers of children and young adults were using his land as a short cut. Over and over again his cows were being driven from the brook, when wanting to drink by showers of stones. All that he asked was a fence was put up and the paddock brought back up to decent repair. Charles also made the point that he was one of the first to suggest a place of recreation, and had contacted James Tomkinson and they had decided on a piece of land, only for the Committee to jump in and take over. He also spoke to him about land for the Cottage Hospital which Tomkinson had also agreed to give.